A giant of of 20th century music, Coleman Hawkins popularized the tenor saxophone as the solo instrument we know today. In 1924 he joined Fletcher Henderson's band and began a tenure which lasted over a decade. In 1939 Hawkins recorded his most famous composition, "Body and Soul." It was a huge hit and innovative because of its improvisation. His 1948 composition "Picasso" is considered the first unaccompanied saxophone solo ever recorded. 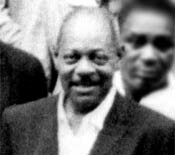 Hawkins participated in early bop dates after he hired Dizzy Gillespie, Thelonious Monk and Max Roach.